Search for caterers, event halls and reception halls for your wedding or local event. 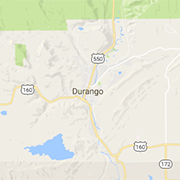 Durango, Colorado is a perfect destination for your big day! CJ's Diner is a local favorite serving up some of the best breakfast in town along with lunch and catering available. You always feel like family and you always leave full. Experience the best tasting coffee around at Durango Joes, where we pay at or well above Fair Trade prices for the coffee you enjoy. A stunning 1,100 acre organic farm 20 mi. from Durango with vineyards, winery, tasting room, and full service wedding and special event venue with catering available. A taste of Tuscany 15 minutes from downtown Durango. Savor a seasonal Mediterranean menu, great wines, & pristine La Plata mountain views. Events, catering & full bar. Unbelievably delicious food served with love after being prepared by hand and made to order. The Chuckwagon is located at Vallecito Lake by the Community Center.